Take any regular medications the day of your procedure, slerotherapy does not require you to take any pre-operative medications. You may also eat a normal breakfast or lunch the day of this procedure, sclerotherapy does not require you to fast at all. Before the procedure our nurse will take a look and mark up your spider or varicose veins, this will determine how much sclerosing solution will be used. The nurse will then prepare you for your procedure in one of our treatment rooms. Please inform us if you take blood thinners such as Coumadin (Warfarin), aspirin or Plavix, although this typically does not affect your procedure. We ask that you stop taking these medications 4 days prior to your procedure. Sclerotherapy is a safe procedure requiring no anesthesia, typically done right in our doctor’s office. A very small and painless needle is injected into the vein. The doctor uses this needle to inject a small amount of sclerosing solution into the vein. This solution irritates the vein wall and results in a permanent closure of that vein. 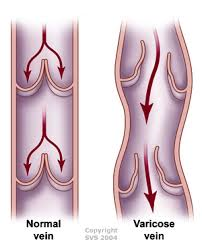 Once the vein has been closed it will typically dissolve in the body and disappear in approximately 1-3 months. Your treated area will be wrapped in an elastic bandage which you will need to leave on for two to three days to minimize bruising and swelling. You should elevate your legs for two to four hours following your procedure as well as take two-twenty minute walks for the next several days. While walking is strongly encouraged, we do ask that you refrain from any stressful or pounding activities such as weight lifting or aerobics for one week. You may also be asked to wear compression stockings for a short period of time. Do not apply moisturizer on the day of treatment. Wear slacks or loose trousers and sandals or loose shoes to allow for the thickness of the bandages and compression garments. Walk for 15 minutes immediately after treatment. Walk 10-15 minutes each hour while awake for the first 24 hours after your procedure. If sitting, elevate the treated leg to reduce swelling. Be prepared to wear graduated compression garments (stockings) continuously for 72 hours after your treatment. After 72 hours, wear the compression stockings during the day for 7-10 additional days. Maintain normal daytime activities and avoid standing still for long periods. Talk with your provider if you plan to travel on a flight greater than 4 hours within the first 6 weeks post-procedure. In the ablation procedure (also referred to as ELVS or VNUS procedure), a small needle is placed into the saphenous vein in the thigh or calf using ultrasound guidance. A small plastic tube, called a catheter, is then advanced into the vein through the needle hole and positioned in the uppermost aspect of the vein using ultrasound guidance. Energy is then transmitted through the catheter as the catheter is pulled back through the vein. This energy heats and damages the vein wall. The vein goes into immediate spasm and scars down, permanently closing the vein and preventing further leakage of blood back through the vein. The procedure is performed using local anesthetic, with typically no sense of discomfort whatsoever during the ablation procedure. You will be asked to walk immediately following your procedure and will also be asked to take at least two 20 minute walks per day in the several days following the procedure. While walking is strongly encouraged, we do ask that you refrain from stressful, pounding activities like weightlifting or aerobics for one week. Some bruising or soreness is fairly typical 3-7 days following your ablation procedure and is usually well-controlled simply with oral nonsteroidal anti-inflammatory medications. Following endovenous ablation, with or without microphlebectomy, the leg will be wrapped in an elastic bandage for 48 hours, after which you will be asked to wear a compression stocking on the treated leg for seven days, from morning until bedtime. Along with walking, the stocking promotes good flow through the normal untreated veins of the leg and keeps treated veins collapsed while they permanently close down. All patients who are treated with ablation are typically seen in follow-up at The Vein Clinic in 2-3 weeks. Often performed in combination with endovenous ablation, or occasionally with sclerotherapy, microphlebectomy is used for the removal of typical, bulging branch veins which lie just below the skin’s surface. Tiny microincisions are made along the course of the vein to be removed. A special instrument is then used to hook the vein and the segment of vein is then removed through the tiny incision. These microincisions are so small that there is usually no need for a suture to close the tiny hole. Small sterile adhesive strips are placed over the microincisions. Some bruising or soreness is fairly typical 3-7 days following your microphlebectomy procedure and is usually well-controlled simply with oral nonsteroidal anti-inflammatory medications. All people treated with microphlebation are typically seen in follow-up 2-3 weeks after their procedure. Thrombolysis utilizes the well-proven and time-tested clot-busting agents, already proven useful in the treatment of clots in the treatment of stroke, heart attack and arterial thrombosis. The most common drug currently utilized is tissue plasminogen activator (t-PA). With this technique, a small catheter is placed into the vein behind the knee under ultrasound guidance, through a very tiny nick in the skin. The catheter is then actually directed into the clot under x-ray guidance and the clot-busting drug is slowly infused through the catheter. Depending on the age of the clot, the infusion and clot dissolution may be completed in a couple of hours or may take as long as a day or two. If there is an underlying blockage in the vein that may have caused the clot to form or would act as a stimulus for new clot to form, this may be able to be treated with angioplasty right at the time of the thrombolysis procedure. 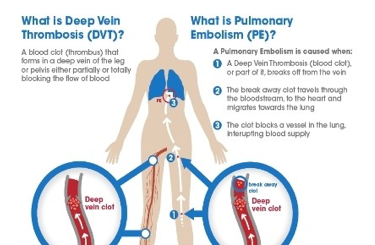 After thrombolysis or pharmacomechanical thrombolysis you may be able to be discharged the same day or may spend an evening in the hospital to allow for observation or perhaps initiation of blood clotting medications. Most patients will be sent home on some type of anti-clotting medication. 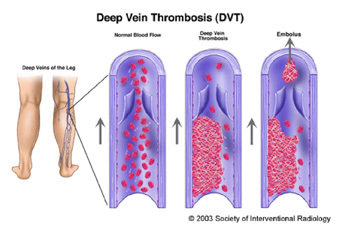 This is to prevent clotting while the lining and valves of the veins are given time to heal. Blood-thinning medications are usually continued for a minimum of six weeks following treatment. Most patients are also started on a special compression stocking that encourages blood flow upward through the leg and helps prevent pooling of blood. Normal activity is also strongly encouraged, as muscular activity helps to pump blood through the veins of the legs. Most patients will be seen in follow-up within the first week or two in The Vein Clinic. With this technique, the clot-busting medications are injected through a specially designed catheter that actually breaks apart and softens the clot. These special catheters utilize an ultrasound beam, or a special spinning wire that softens the clot. This allows the drug to seep into the areas of the clot that would otherwise not be able to be exposed to the medication. Clot has a very strong attraction to the clot-busting agent and the more of the clot that is exposed to the medication, the faster the clot will dissolve. This has decreased the time of the procedure, the cost of the procedure and the amount of the clot-busting drug that is necessary to achieve a successful result. In some cases, a successful result can be achieved in as little as 20 minutes.